We rely on our computers even more than ever. The usual complaint made about a personal computer is that they run much slower than they did brand new. This article will outline the most popular procedures that you can do to turn back time to when your computer was fast and enjoyable. Windows and Macintosh computers benefit from periodic reboots. In fact, it is good practice to shut down your computer at the end of each day to give it a rest and save energy. Let’s say your computer goes into sleep-mode, depending on your power configurations your hard drive may spin down and CPU will consume less energy but the computer is still not shut down. Fans will still operate, all motherboard components will be powered and most importantly; the power supply will continue to fully operate. The only benefit from leaving your computer on constantly is we will spend much more time together. The fans will constantly cycle air through the case creating an insulating layer of dust/lint which will need to be cleaned out frequently and you will drastically shorten the life of the various computing components which will require our expertise to repair and possibly replace. 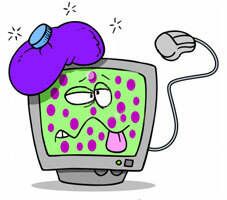 It is very common for anti-virus and anti-malware software to stop working and not update or do regular scans. In many cases this type of software gets installed and forgotten about. Maybe it warned you a few months ago that it was expiring and you ignored it. Launch your anti-virus and anti-malware software and see first off if they are still active, and when the last scans were done. If all is well do the update anyways, and do a full complete scan and see what comes up. If your anti-virus has expired, renew it or get some new anti-virus software. There are a number of free anti-virus software products available online that work very well. 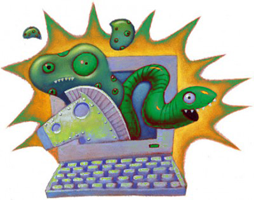 Anti-malware software has been around for a while but is commonly overlooked. As with anti-virus there are a number of titles available for free download one or two and give them a try. With both anti-virus and anti-malware software a rule of thumb is to do a scan at least once per week, more often if it is finding issues not just cookies. Windows has a utility called Disk Clean up, click the Start button go to Programs > Accessories > System Tools and you will find Disk Cleanup. When it launches it will do an assessment of what can be cleaned up, however you have to make the choices of what gets done. Typically what need to be cleaned up are Temporary Internet files, Temporary files. If you only check these two choices this should give you improved performance with your computer. The other choices will give you more available disk space. Realistically if your free disk space is less than a couple of gigabytes it might be time to upgrade your hard disk space, before everyone jumps all over me, yes you can have less, but you are going to be constantly fighting for disk space, besides windows defrag needs 15% free space to run. 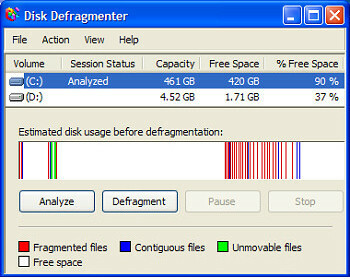 Defrag your hard disk. Windows will typically store data on any available space on your hard disk, putting little bits of data here, there and everywhere. Running Defrag on a regular basis will help to consolidate files on your hard disk making them faster to access. You can easily schedule this in Windows 7 and Vista. Lastly, go through your Programs or Add or Remove Programs in your control panel, and delete software that you know you don’t use any more, also have a look around for old copies or multiple copies of antivirus software and uninstall them as well. When you are uninstalling software be sure to remove software only that you know you are no longer using. Be cautious that you don’t delete any necessary software, if in doubt leave it. Remember, a virus free computer that is cared for, regularly exercised and refrains from smoking will live a long and happy life.